The definitions my Chinese-English dictionary gives of these combinations with 只 ㄓˇ (zhǐ) are not as inclusive as how my tutor was using them. I don’t fault the dictionary. It has helped me a lot. It is just hard to give all the connotations and examples in the dictionary format. 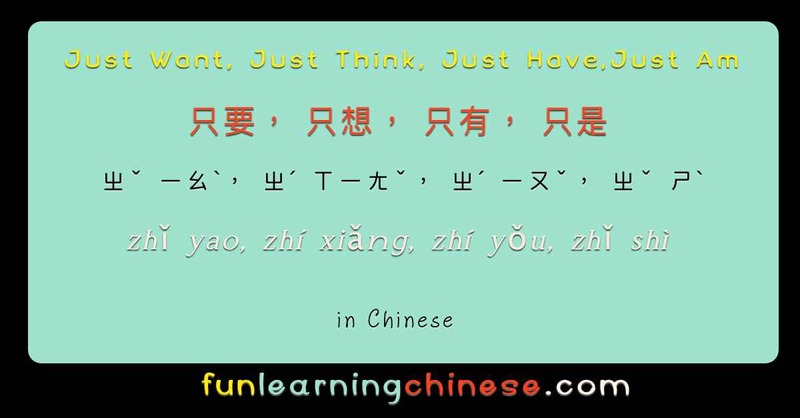 In our discussion, it was re-emphasized that when Chinese speakers use 想 ㄒㄧㄤˇ (xiǎng), the main literal meaning is “to think,” but the implication to the Chinese is that if you are thinking about it, you “want” it. Thus, “to want” is implied. In the English, the word order is sometimes the opposite of the Chinese. Whereas in Chinese it is considered proper to say 只是 ㄓˇ ㄕˋ (zhǐ shì), literally “only am,” in English it is easily as common to say “am only” or “is only. Every day I only have 24 hours. If I want our house clean I must spend time sweeping and scrubbing. However, I only think/want to spend time in the garden, consequently my house probably will not be too clean. Sometimes my puppy chews many things, then I only want it to take a nap. That would be just right! I am only one person, so I am not able to finish all the things I want to do. Very quickly it will grow bigger and bigger. Therefore, I must relax; I don’t want to be too nervous all the time. Sometimes it thinks it is a person, it wants a lot of love like everyone does. And while I play my flute, it tries to sing! Some people might think its singing is too noisy. Actually, it just wants them to know is it is happy! I am only a teacher. It is only a dog. I just want to be with my friends. I only have two hats. All I want is for you to know that I love you. I only have a hundred dollars; what about you? Only Boo and I are at home. or I only have Boo with me at home. ❶ Although 只 ㄓˇ (zhǐ) technically has a third tone, recall that a third tone right before another third tone is changed to a second tone. ❷ MW is a common abbreviation for “measure word”. Measure words are used before nouns much like we use words like a “herd” of cows or a “wad” of gum. 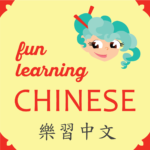 Chinese measure words are used with almost every noun, whether singular or plural. They usually are partially descriptive of the noun, indicating things like length or size. When in doubt, you can sometimes get away with using the most common measure word 個 ㄍㄜ˙ (ge.) I have a this Chinese Measure Word Dictionary and I find it quite handy. ❸ 只要 ㄓˇ ㄧㄠˋ (zhǐ yào) has a lot of different, but similar meanings. It can mean “as” , “as long as”, “if only”, “only if”, “and while”, “only want”, or “in this situation or on condition that.” It is really a matter of context to know how to translate. ❹ In most cases, the order of the Chinese characters makes an important difference, but not with this word. ❻ This combination is specifically used when referring to a condition that already exists.